What does a tiger know about success? Quite a lot! When the young tiger Ravi, who is not respected even by the hyenas, is challenged to a fight by his powerful rival Bal, Ravi seeks help from Amba, the old white tigress. She teaches him the five principles that will transform him into a self-confident, resolute, and creatively intelligent tiger: clarity – power – fighting spirit – concentration – constancy. Here are the fundamental strategies for anyone who wants to achieve success in life. 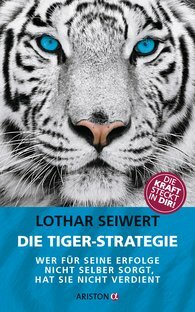 Inspiringly narrated and delightfully designed, The Tiger Strategy shows how we can develop those traits necessary for mastering life. "The author vividly illustrates his strategies for success through a captivating and intriguing parable about the young tiger Ravi."